GREENSBORO, N.C. – A panel of three federal court judges has issued a unanimous order that incorporates the recommendations of the court-appointed Special Master, Dr. Nathan Persily, into North Carolina’s state legislative districts. 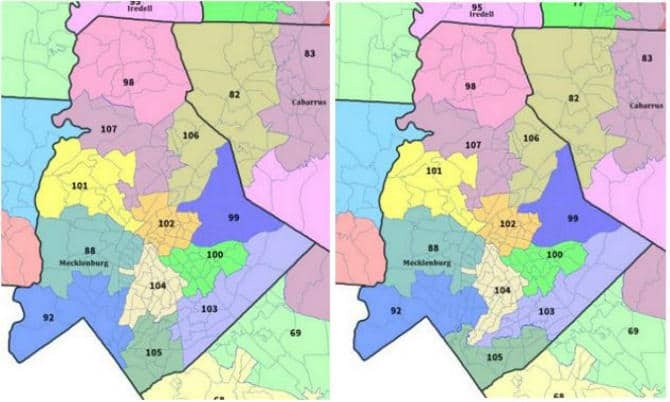 The Dr. Persily was asked to alter nine state legislative districts after the Court identified that the 2017 legislatively-enacted plans that were supposed to remedy the racial gerrymandering identified in the 2011 plans failed to adequately remedy the constitutional flaws or otherwise violated state law. The districts as ordered by the court are now the official state legislative districts of the state. This same three-judge panel found in 2016 that twenty-eight state legislative districts to be unconstitutional racial gerrymanders. On July 31, 2017, The federal court for North Carolina’s Middle District ordered the General Assembly to redraw legislative maps by September 1, 2017, in order to remedy the unconstitutional racial gerrymanders. The legislature adopted new maps on August 30, 2017. Plaintiffs filed objections to the second enacted district plans and a hearing was held before the panel of three judges on October 12, 2017. On October 26, 2017, the Court announced its intention to appoint Dr. Nathaniel Persily to the position of “Special Master” to review the newly adopted redistricting plan and recommend adjustments to ensure the map’s compliance with state and federal law. Dr. Persily’s appointment became official on November 1, 2017. Dr. Persily issued a draft recommending changes to the state’s redistricting plan on November 13, 2017, and he solicited feedback from the plaintiffs and defendants. Both parties submitted comments. Meeting the deadline set by the three-judge panel, Dr. Persily submitted his final set of recommendations to North Carolina’s Middle District Court on December 1, 2017.